Formatting: the single-column format used by the Starting Out series works well due to the large amount of text relative to variations presented, although occasionally the diagrams (always paired for space reasons) appear in slightly awkward places. The diagrams are large and can be especially helpful for the reader when referring to the book without a chess set, although they do not appear frequently enough to allow a read-through of the book in this manner (unlike for example Logical Chess: Move by Move). Typos: I found several move typos, concentrated toward the first half of the book. Sometimes these were incorrectly numbered moves after explanatory text, although on occasion typographical errors appeared in the moves themselves. While the reader can overcome this without much effort, it was annoying to see the editing lapses. Stonewall Dutch: this was the most interesting section for me, as a number of new ideas (well, new to me) were introduced; it was also the first of the three main Dutch setups presented. The Stonewall is not a very popular opening variation, but I find it fascinating and it is interesting to see how many world-class players have used it over the years (from Alekhine to Kramnik). While all of the games contained in the book were well worth replaying, I found it a little strange that the theory narrative focused on the Modern Stonewall setup with ..Bd6, while a number of the games presented featured ..Be7 instead, with no real discussion of the differences. That said, there are a large number of ways to reach a Stonewall-type setup and there is relatively less theory out there on it in general. Classical Dutch: while I probably had the least amount of personal interest in this section beforehand, it proved to be nearly as fascinating as the other two major setups. GM Kevin Spraggett's games in particular stand out (as they did in the Stonewall section). Leningrad Dutch: I was the most familiar with this form of the opening, having a while back purchased Steffen Pedersen's The Dutch for the Attacking Player. I found the Starting Out presentation of the Leningrad setup (characterized by g6/Bg7 and ..d6 in the center) to be quite useful, especially regarding the major choice faced by Black in the main line on the 7th move (..Qe8, ..c6 and ..Nc6 being the options). This book uniquely looks at the ..Nc6 option seriously, rather than dismissing it like most other works. 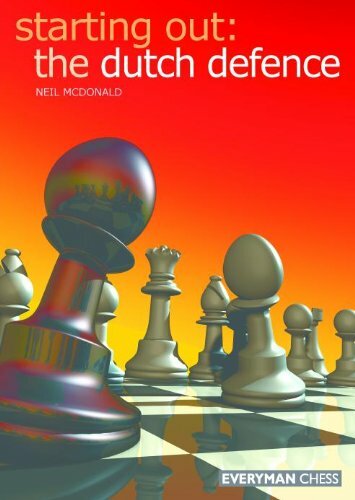 Anti-Dutch: while not necessarily exhaustive, the ideas presented in the book treat the wide range of possibilities quite well and provide the Black player (my perspective) with good, easily understandable ways to meet the various White gambits and alternative setups. When an author has experience with an opening and can present it in an interesting and engaging manner, as was done here, the reader can get a great deal out of it. As someone new to the Dutch in general, I also found it quite useful when he made points about move-orders, transpositional possibilities between the various systems, and specific strategic and tactical concepts that show up repeatedly. This book accomplished exactly what it was aimed at doing, which is to provide a broad survey of the opening that at the same time has enough depth to be useful as a guide to practical play as well as future, more detailed study. If you take up the Dutch, our openings are starting to converge ! I've played the Dutch for 2 years and the Caro Kann for 4 years, and have even recently started playing the English as a second option to e4. I've mainly played the Leningrad up to now but have recently become interested in the Classical, playing my first tournament game on the weekend. I'd recommend Simon Williams as a good role model for the Classical. Both his Play the Classical Dutch book and his Killer Dutch DVD are highly recommended. Thanks for the recommendation, I recall seeing some references before to Simon Williams as a model Classical Dutch player. Probably for the next blog update I'll post something on openings selection, considering I'm in the process of learning a new one, but this time more on the "why" than the "what". As an aside, I modified the original post to put in Kramnik instead of Nakamura as one of the most recent exponents of the Stonewall Dutch; Nakamura of course is famous for playing the Leningrad variation.